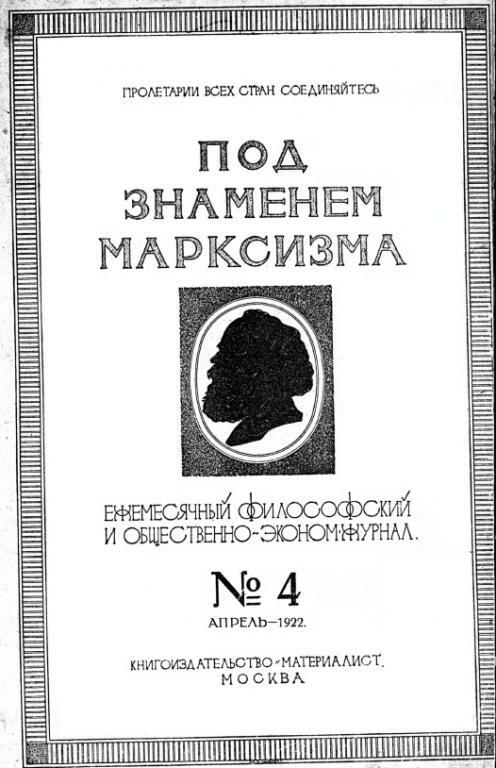 Pod znamenem marksizma was a Soviet theoretical/philosophical monthly journal published from 1922 to 1944. This is first part of PZM's bibliography. libcom.org does not agree with the politics of the journal, but we reproduce it here for reference. woow Noa that is very interesting. Do you have a pdf version of this? How could you access to that? Well, I can appreciate the irony that it is an anarchist website which is the first ever to make available the table of contents to the foremost theoretical journal of the Soviet Union. This translation project looks fantastic. I would be very interested in reading more of the debates between II Rubin and others over Abstract Labor and other economic issues. What are the current plans for translations? Is this just one person's project or are there several people working on this? Here I made a thread about this journal. There's a lot of articles related to Rubin's work (e.g. I found 'On controversial questions of commodity fetishism' 1929, No. 10-11 is an intervention against Rubin's opponents, like S.Bessonov, but I decided not to translate it because it was poor-styled polemics.) But I think there are definitely other economic articles (e.g. a review of Grossmann or the falling rate of profit) that I would like to read. On my own it's not possible to do much more at present. The 5 articles on money will be included in a volume on Marxist essays on money, but my translations require serious correction (in fact, perhaps it's best to take down my libcom versions). All issues of PZM have been scanned for the years 1922-31. If anyone wants a copy, just ask and I'll send a link. There is an intention to make a selection of PZM articles for translation/publication. Again, preferences and concrete suggestions are welcome. thanks very much for all this! I would say leave them up, but you could always put a comment saying that the translations could be improved upon. That's cool that the others have been scanned. Would you want to upload them here? The comrade who undertook the scan work prefers not to have it put online. The first year (1922) is available though: http://catalog.hathitrust.org/Record/007848926 (if outside US, use a proxy). I didn't OCR them or compress the file-size, but someone else hopefully can do that. Someone pointed out that in the translated index I apparently wrongly attributed some articles to Arnost Kol'man. It should be А. Гольцман (A. Goltsman). I head someone else is thinking about Italian translations from PZM. I should point out that there probably already exists some translated articles in the following book: Scienza, filosofia, politica in Unione Sovietica 1924-1939 by Silvano Tagliagambe, 1978, p. 527.